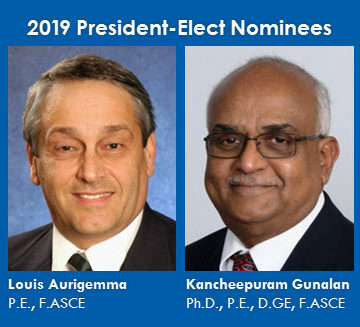 The official nominees for 2019 ASCE president-elect, as selected by the Society’s Board of Direction Nominating Committee, are Louis C. Aurigemma, P.E., F.ASCE, and Kancheepuram (Guna) N. Gunalan, Ph.D., P.E., D.GE, F.ASCE. The Society’s election will be conducted May 1 through June 1 via online balloting. Members at the grade of Associate and above in good standing as of April 1 will be eligible to vote. Aurigemma currently works as a consulting engineer, following a long and varied career in both the private and public sectors, mostly in Florida. He served as the executive director of the City of Riviera Beach (FL) Utility Special District from 2010 to 2016. Before that he was the director of civil engineering at Keith and Schnars, P.A., in Fort Lauderdale, and worked for two decades for the City of Coral Springs. 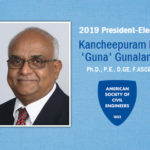 Among his many contributions to ASCE, Aurigemma served as the Board of Direction treasurer (2013-14) and the District 10 Director, 1999 to 2002, had two separate stints on the ASCE Executive Committee, and, most recently, he was a member of the Task Committee on Governance Structure (2017) and the Task Committee on Geographic Boundaries (2016). “Investing in infrastructure is key to our future quality of life. So let’s ‘dream big’ and invest in infrastructure! 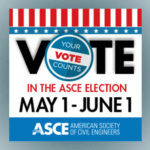 ASCE members, let’s make this vision a reality,” Aurigemma said in his candidate’s vision statement. Gunalan is vice president of alternative delivery at AECOM, where he is a capture manager on major infrastructure projects. Previously, he was a vice president for Parson Brinckerhoff. His active membership in ASCE over many years includes leadership roles as Region 8 director (2009-12), Region 8 governor (2005-07), Utah Section president (2002-03), and Texas Section High Plains Branch president (1992). Most recently, he served as a governor for the Geo Institute and was a member of the Steering Committee for the 2017 ASCE India Conference. “I will work very diligently with your support to shape and structure an ASCE that is relevant to both its members and the profession; financially stable; nimble and influential globally. I am passionate about our profession and I am proud to be a civil engineer,” Gunalan wrote in his candidate’s vision statement.